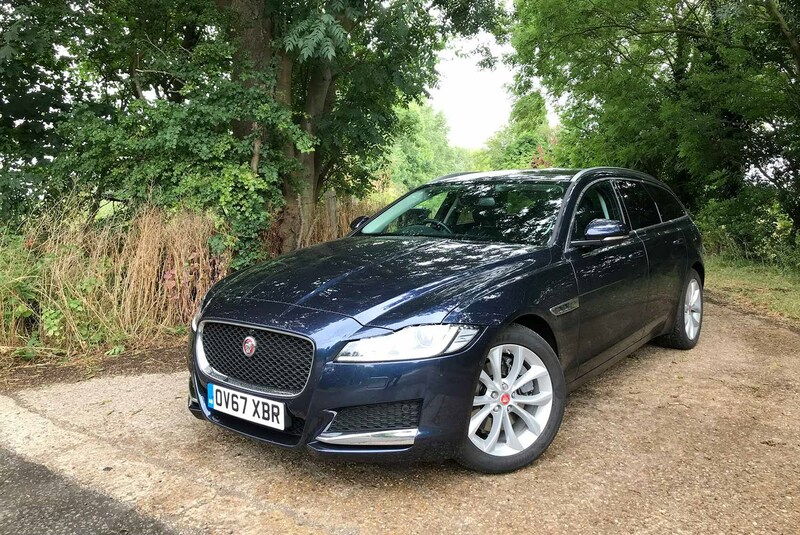 Waiting at the roundabout near Jaguar’s Whitley engineering centre, I found myself coveting another XF Sportbrake: an R Sport in vibrant Caesium Blue, with black rims and gloss black gills. In the XF aesthetic stakes, it was the Tess Daly to my Bruce Forsyth. It shows how deleting the chrome and rolling on bigger rims eliminates one of my bugbears about the frumpy Sportbrake Prestige: its bulbous rear three-quarter section. Not that I’d upsize its 18-inch alloys: with the Goodyear Eagle’s 45 per cent sidewall, they still pack the arch, don’t compromise the splendid steering and have proven utterly impervious to the odd kerbside contact. This aesthetic conversion reflects my XF Sportbrake experience in microcosm. It replaced an Alfa Romeo Giulia Quadrifoglio: ballistic 503bhp petrol V6 for whimpering 178bhp diesel four-pot, with a near-200kg weight penalty. And yet the Sportbrake is really rather lovely to drive. The steering makes this 1720kg car feel alive and darty – Ben ‘Maximum Attack’ Barry even complained the rack was too quick during the Our Cars test day in Snowdonia, featured in our August issue. It’s a wagon you can push in corners, with loads of grip and then a nice line in feedback if the grip’s about to run out. The Sportbrake feels inherently planted and its bodyroll well contained, more than your typical boat-in-a-storm SUV. 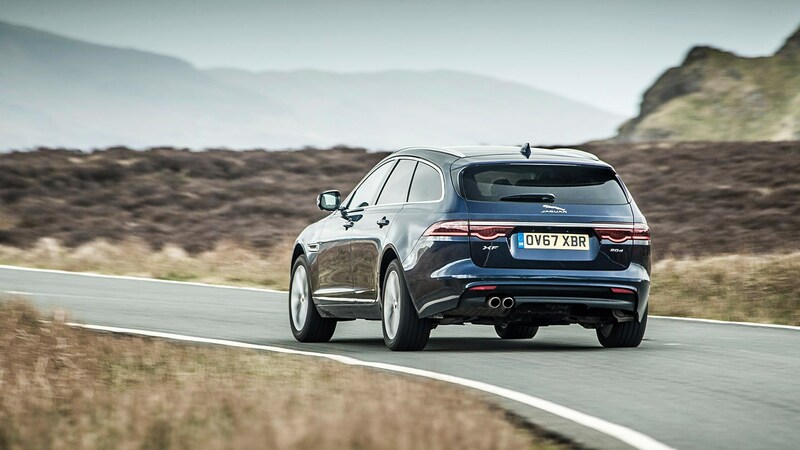 That was all too evident when making a burbling V6 Maserati Levante look all mouth and no trousers: the XF dug into the curves, surfing the cambers and carrying speed, while the tottering 4x4 was marooned in the background. This dynamism doesn’t come at the expense of comfort: the Jag bobs serenely over high-speed crests, though it does thump over potholes and expansion joints. And it’s largely a hushed place to be at motorway speeds. All good. But the drivetrain is more workmanlike. Ours was the mid-ranking Ingenium diesel engine, with sufficient punch for sliding into motorway gaps and an eager launch upon kickdown. But it feels about as quick as an 8.8sec 0-62mph time suggests, with an engine note ranging from shrill to whiney and there are some vibrations when pulling from low revs. Truth be told these are criticisms you could aim at most four-pot diesels: I just prefer the higher-revving character and smoothness of petrol engines. 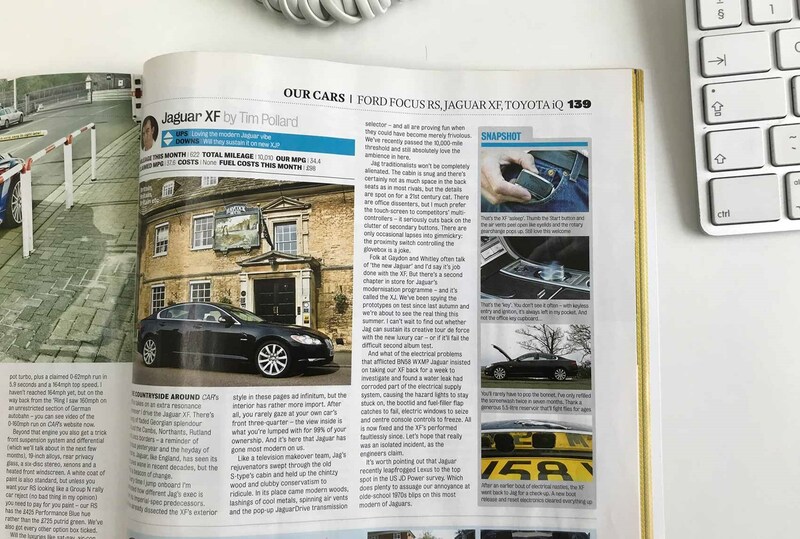 But there’s no denying the appropriateness of diesel for a big estate: going more than 500 miles between fill-ups was appreciated, though that was courtesy of the 66-litre tank rather than stunning economy – we averaged 42.8mpg over nine months. Aside from auto-swivelling air vents and the pop-up gear selector, there’s nothing flash about the cabin. The dash is low-set and solid, with a lovely embossed metallic facia curving into slivers of gloss black trim on the door. Smart but simple. The 10-inch touchscreen’s graphics are clear and it’s pretty responsive, and the frame doubles up as a low shelf for steadying your hand during interactions. But having to use Jaguar’s InControl smartphone app to secure a robust FireWire connection was annoying. The big screen comes in a £2670 bundle with the clear digital instrument binnacle and thumping 825w Meridian sound system: money well spent. As was the £1125 panoramic roof that enlivened the standard black leather cabin, and the £760 Cold Climate pack including the ice-melting heated windscreen. Money not well spent was the skittish gesture-controlled sunblind (£205) and 10-way electric front seats (£805) – spend extra to include lumbar support and position memory, or better yet stay with a manual. The bounteous footwell space was welcome, allowing one daughter to walk across to her child seat, though lifting the other one into hers often involved a bit of head-banging (for her) and back-ache (for me). And so to the crux of the estate vs SUV debate. 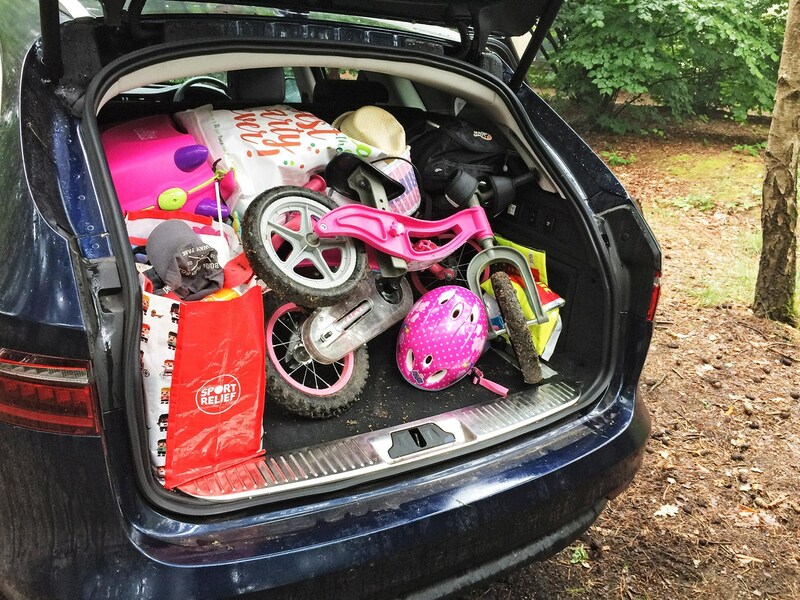 If you value an elevated driving position and easy child-loading, your choice couldn’t be broader as manufacturers pile into SUVs and crossovers. 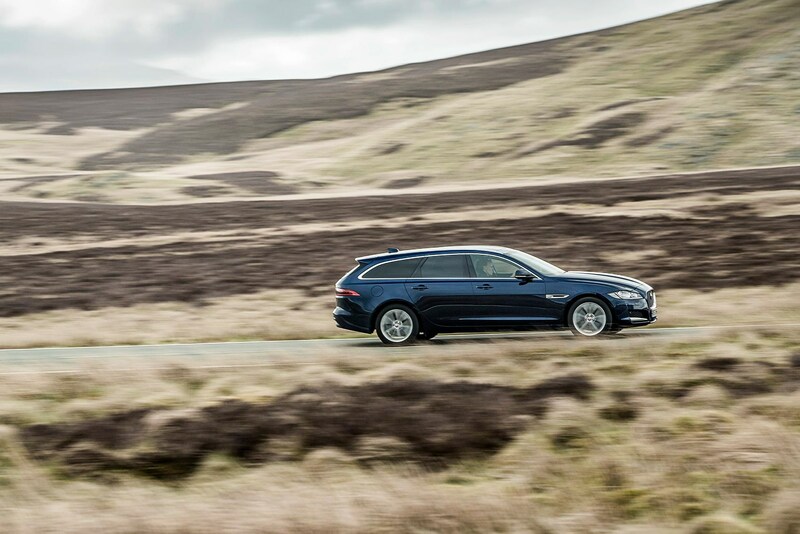 But if you rate handling, sleekness and economy more highly, then the XF Sportbrake is a fine car worthy of your consideration. 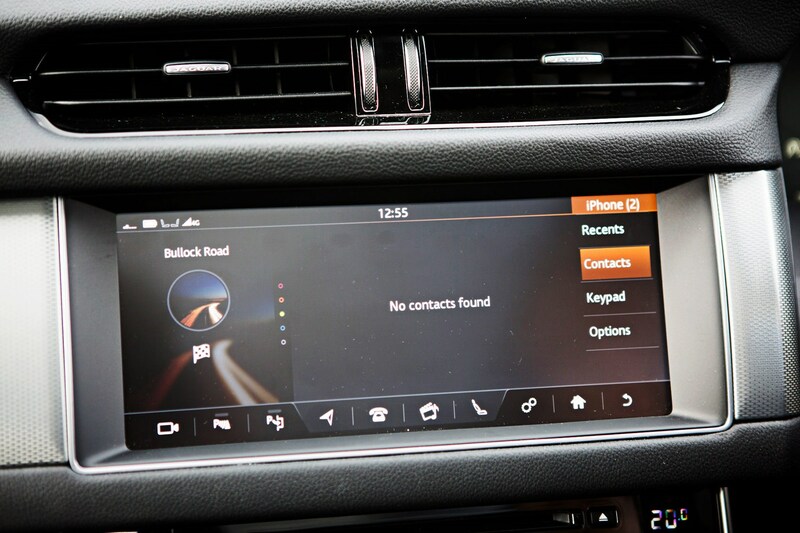 This XF has some useful tech: a wi-fi hotspot, pin-sharp rear-view camera, nav map showing real-time congestion. This is eclipsed by the daily bother of trying to connect my iPhone: the car spends several minutes refusing to accept the phone is there. Me getting to school in the '80s was a lottery, thanks to the mechanical unreliability of Mum's Fiat 126. Progress, of sorts. All is quiet on the A21 towards Antwerp. One daughter is asleep, my wife has withdrawn conversation following my tantrum about her buying the ‘wrong’ croissants, and the Jag is cruising calmly at an altitude of 181m above sea level. 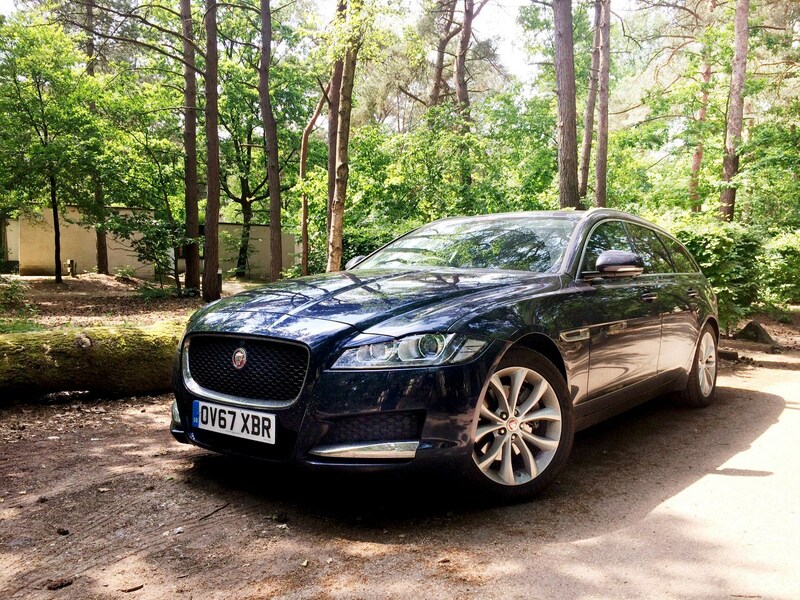 We’re returning from CenterParcs near Eindhoven, and the XF Sportbrake was made for a journey like this. The grey sky spits inconsequential raindrops, and the surrounding traffic is equally dreary: the highlight is a mesh-and-spotlight-festooned 206CC that makes Marcus Grönholm’s old rally car look understated. The 2.0-litre turbodiesel is murmuring gently in the background, the Goodyear rubber only gets vocal on coarse tarmac that’s under repair, and there’s barely a lick of wind noise. For mile after mile, the Jag glides serenely over Belgium’s smooth motorway topography. Occasionally the gearbox software lands us in the engine’s sub-1200rpm boggy patch, but otherwise the turbo-diesel pulls adequately. And the response to kickdown is good, helping the XF to fend off the incessant tailgaters before finding a gap to pull into. 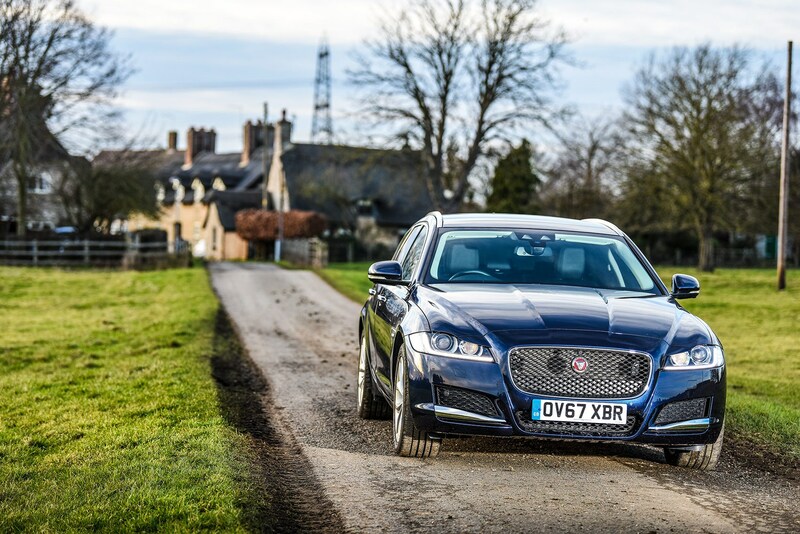 Jag offers an uprated 2.0-litre diesel with twin turbochargers, and if you can live with the economy and CO2 impact, its extra 52lb ft of punch at lower revs would be pretty welcome. Rearwards I have all the visibility of a Lamborghini Diablo, due to the jumble sale piled into the boot. I considered a £200 bike rack: turns out it would have been unnecessary expense. An F-Pace SUV might haul more, but it wouldn’t tip into the wickedly curving slip roads as pointedly as this estate with its fast-acting steering, nor feel so stable. 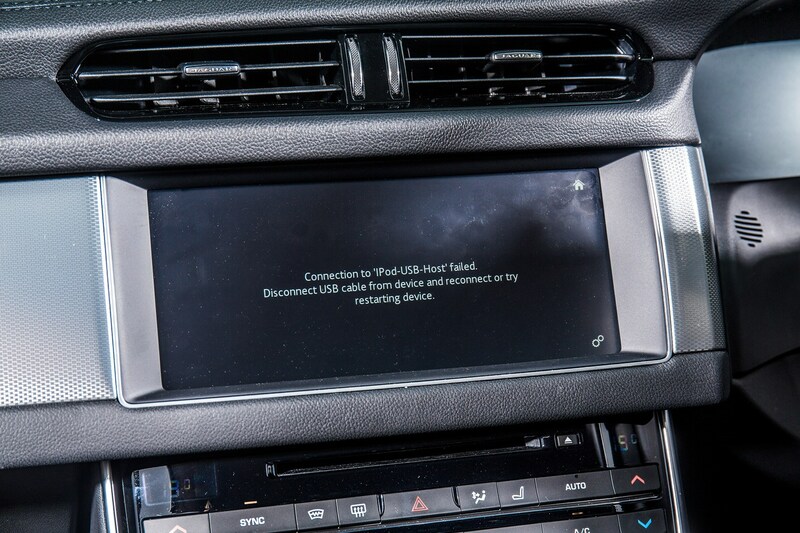 Jaguar’s infotainment has many bugbears, particularly its laboured attempts to connect a phone, but its navigation search – controlled by an on-screen pop-up keyboard – unearths a host of suitable parking for a Bruges detour. And then we are home. I have my reservations about diesel’s refinement and character. But this round trip reminds me of its inherent suitability for big motorway cars. We drove 583 miles to Holland and back on a single tank, averaging 49.7mpg according to the trip. No electric car can compete with that. Yet. I’ve been driving a petrol XF while the diesel Sportbrake’s nose is being reset. Naturally its minimised vibrations and more hushed cruising are welcome, though its vacuum-cleaner soundtrack – typical turbo-four fare, alas – is scant improvement. 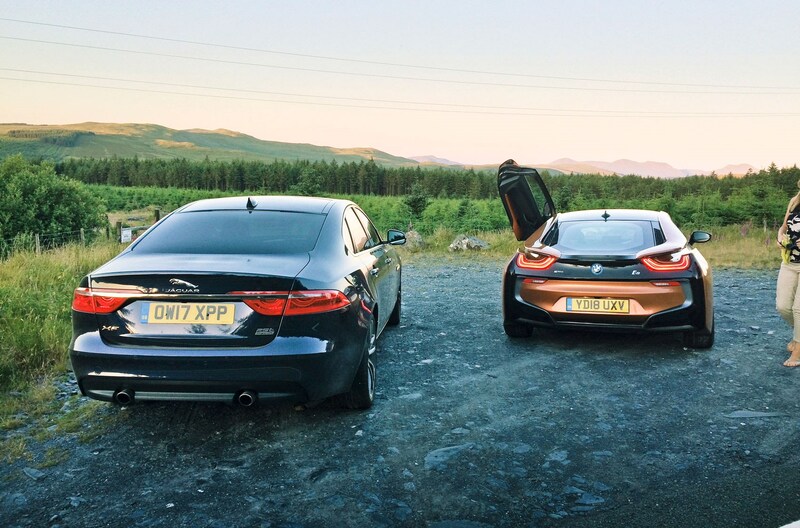 But with 247bhp, the 25t packs almost 70bhp more than the diesel, handy extra punch when trying to chase a BMW i8 on a Snowdonia video shoot. The all-wheel-drive system is tactile too: when accelerating hard out of corners, you feel the front wheels taking a chunk of the torque and hauling you on. Paid for it with 12mpg less, mind you. PFFUUTT! There’s a muffled sound like air escaping a burst paper bag, a split second of befuddlement as the way ahead looks clear, then a sickening realisation. The Astra that was turning right at the Pontblyddyn T-junction, lured forward by a slowing Kia, hasn’t pulled out. And my Jaguar, progressing into the resultant gap to turn left, has discovered – the hard way – that sufficient gap hasn’t in fact materialised. I stumble out of the XF. Sure enough, a classic rear-end shunt: the Jaguar’s front right bumper has connected with the rear of Steve Robertson’s 56-plate Vauxhall. From a standing start, the contact can’t have exceeded 5mph, but it’s left a squarish divot in the Astra’s bumper. The Jaguar looks messier: scuffed bumper and headlight, its washer cover loose, and the bonnet panel gap has grown, as the wing is slightly displaced. A good morning has turned bad. A few days later, the amiable Steve sends me a couple of quotations for the repair. One bodyshop in Buckley, Flintshire, can replace and paint the bumper, and renew the cracked light that illuminates the reg plate, for £420. That’s the upside of hitting a hatchback with good-value spare parts: Steve spotted a new bumper for £50 on eBay. If only the Jag were so cheap to fix. An approved JLR bodyshop estimates the cost. The good news is that the bumper isn’t dented, so it should be repairable. But the other news is truly bad: the headlamp surround is cracked and needs changing, the wing is out of shape and requires replacement, and £660 of paint will be required to spray the bumper and new wing and blend adjacent panels. Parts are £864, but labour – which could take two weeks – is £1989. And the projected total? That’ll be £4547. And 10 pence. Getting on for five grand for a 5mph fender bender! I guess aluminium panels, beneficial for weight, can easily pop out of shape. And it’s a reminder that items like advanced headlamps, sensors and cameras can ramp up repair costs. I love these mod cons. But Steve is delighted to keep his reliable Astra from being written off, and right now I can understand why. I ran the first-generation Jaguar XF saloon soon after launch in 2008 (see below); it's hard to believe the mid-sized Jag four-door has been here for a decade. It made for an interesting comparison at the weekend, as I snaffled the keys to Phil McNamara's XF Sportbrake estate. Much of the style is intact for the British 5-series rival - the outside has morphed only gradually on from Ian Callum's 2008 original, and I think it's become a handsome car, especially in wagon form. And many of the Mk1's details inside are still visible, from the 'handshake' introductions of the swivelling air vents to the rising rotary gear selector. It seems less show-offy in 2018, and more subdued, but it's still a welcoming cabin and I like the 'gunwale' styling loop encircling the cabin, a cue borrowed from the XJ. Quality is fine, without bowling you over with surprise-and-delight tactility. But I really enjoyed driving the new 2018 XF Sportbrake; it had a polished ability in most regards, especially in its chassis set-up - quashing bumps, lumps and road scars underfoot to leave a comfy ride, yet with enough poise and feedback through corners to satisfy keener drivers. Exactly what a Jaguar should deliver and I recall a similar balance on the Mk1. It's practical too. I much prefer the Sportbrake aesthetic to the saloon's notchback style, and the 565-litre boot swallowed oodles of luggage this weekend for ferrying family members on trips away. On brief acquaintance, it felt competitive with the benchmark A6, 5-series and E-class rivals it's up against - on engineering terms, if slightly lagging on digital and perceived interior quality. A neat effort. 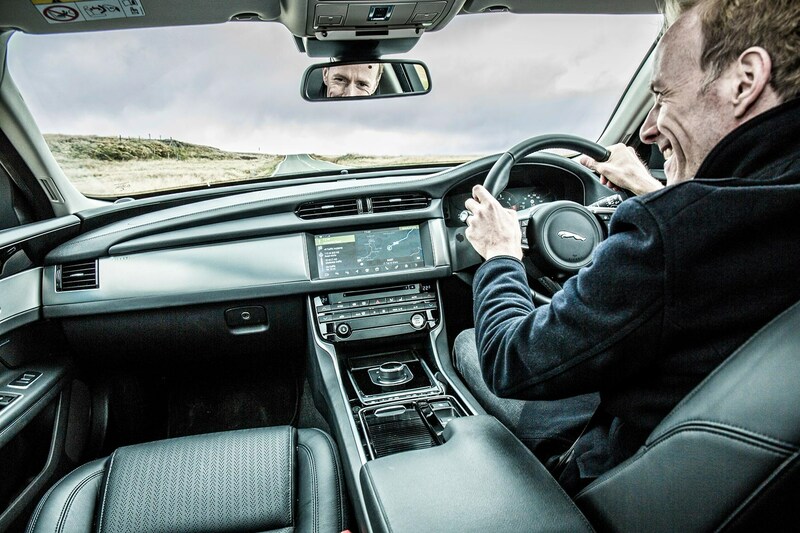 The XF’s man-machine interface is Jag’s best yet, but it’s not without irritations. You can’t favourite a radio station unless stationary. And despite pairing my iPhone 6S twice, it wouldn’t show my contacts unless I used Jaguar’s InControl apps sub-menu – a workaround that failed to cross-check incoming calls with my contacts, so I’d just see 11 digits when someone called. But I’ve found a fix: drowning my 6S! Going back to a 5S without Jag’s app has – hey presto – made my contacts appear. My commute is like watching Blade Runner 2049: engrossing but with only sporadic bursts of action. (Assuming you overlook the visual differences between a futuristic Los Angeles and the Bedfordshire A1.) Its highlight is that unlikely chicane on the Black Cat roundabout’s northbound approach, a window into the set-up of every car. First comes a sweeping left-hander where the body rolls gently outward as the tyres grip nonchalantly, telegraphing that this chassis could swoop through here far faster than the 60 limit permits. Then a nip of the brakes to trim the speed, a turn of the lovely linear steering, and the nose locks into the tighter right turn: not a trace of understeer, even if you’re quickly back on the power because the way ahead is clear. 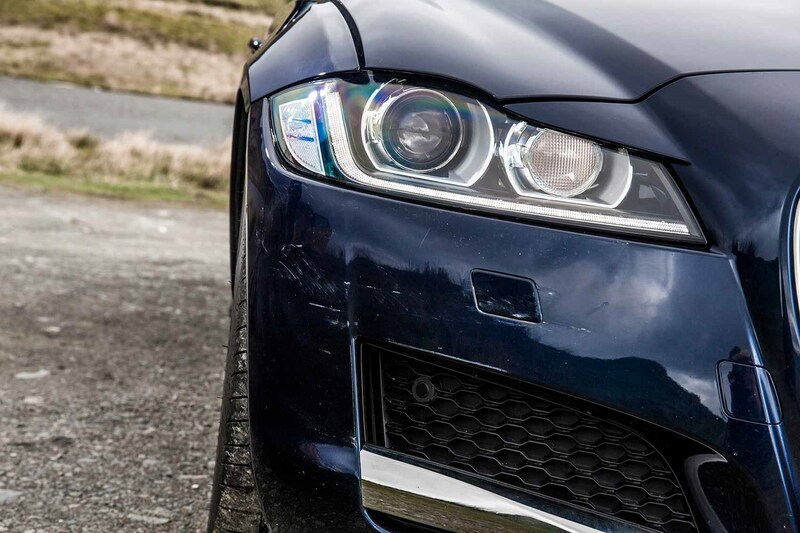 Dynamically, the big Jag is in great shape but it’s not perfect. The Ingenium diesel, though smoother and with less turbo whistle than our 2015 XE suffered, makes a bothersome groan and transmits vibrations under measured throttle load, until a 20-minute warm-up passes. I know fourpot diesels can’t sound like NASCARs, but this one’s frequency is shrill on the ears. There’s a two-tone quality to the ride too. The suspension’s primary gait is loping and lovely. But the onset of high-frequency undulations can cause choppy body movements. It’s not that the XF can’t do cruising: tyre and wind noise are pretty well suppressed. But it’s at its best in action hero mode. You know those Leica cameras, where cutting-edge digital image capture is wrapped up in a classical exterior design? 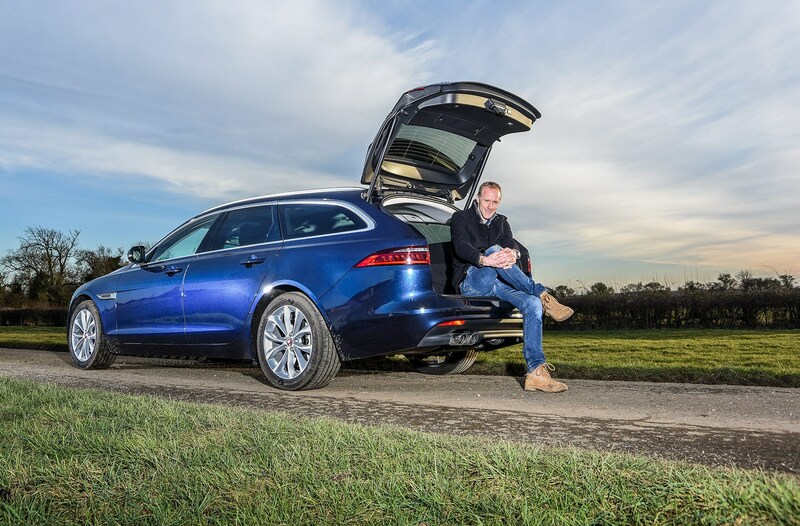 I reckon this Jaguar XF Sportbrake, a 2.0-litre diesel Prestige model, is a kindred spirit. While the F-Pace looped the loop onto the public stage and the E-Pace barrel-rolled along behind – the brashness of SUVs! 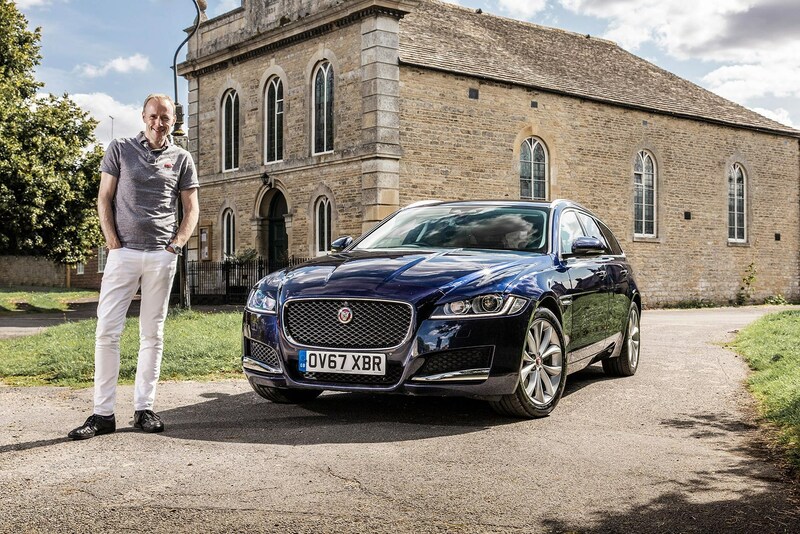 – Jaguar unveiled its XF wagon at the sedate, very traditional All England Lawn Tennis and Croquet Club. Now our XF’s £705 Loire Blue Metallic paint, with glitzy flakes that twinkle in the sunlight, would doubtless be called for a dress code violation. But otherwise Wimbledon’s officials would find little to offend: the base Prestige’s 17-inch rims are only upgraded by a modest inch to this 10-spoke design (£840), and chrome piping is present and correct. 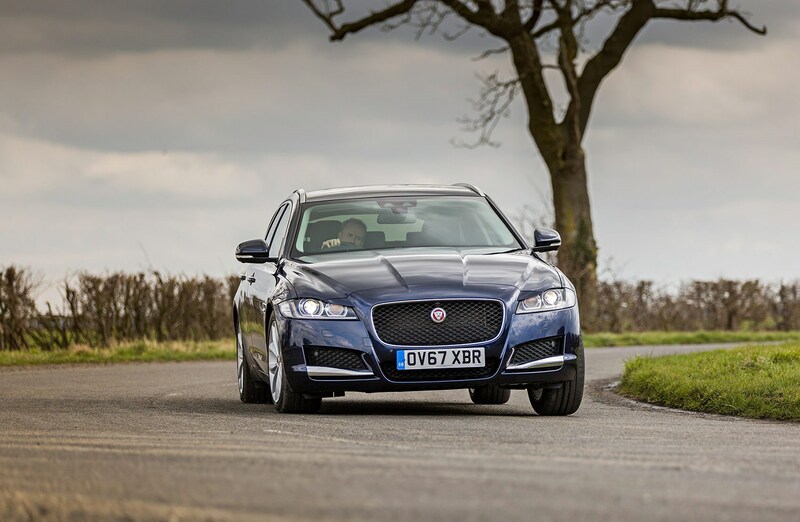 Naturally on today’s Jags customers can opt for sportier R-Design bodykits, strip away the chrome and even select 20-inch gloss black rims, but we’ve gone for a more traditional look befitting this more classical body style. This is the practical Jag for those who find SUVs too bloated or teetering. While the XF Sportbrake is a lot longer than the F-Pace, it’s narrower, lower (naturally) and has heaps of legroom. Indeed rear passengers have more space to explore than Elon Musk. And the Sportbrake’s boot – with a couple of carrier bag hooks and runners housing moveable lashing points – is also wide and long. There’s 565 litres of stowage behind the rear seats, or 1700 with them folded, which you can do via a couple of handles in the boot. Boot capacity is a little less than the F-Pace’s, mind you. That SUV and the wagon appear as close as non-identical twins. Both come in 180PS diesel Prestige trim for £37k, sharing the same aluminium architecture, weighing the same 1720kg, and with the same choice of rear- or all-wheel drive. Ours is the former. The base Prestige XF Sportbrake includes wide, flat leather seats (heated up front), a parking sensor and air springs up back, a powered tailgate and an 80W stereo and 8-inch touchscreen. Plenty of room for customisation, from an extensive and expensive options list. First up, £2670 for the flagship infotainment system, with an 825W Meridian sound system. For me, this is a critical part of the six-month test. 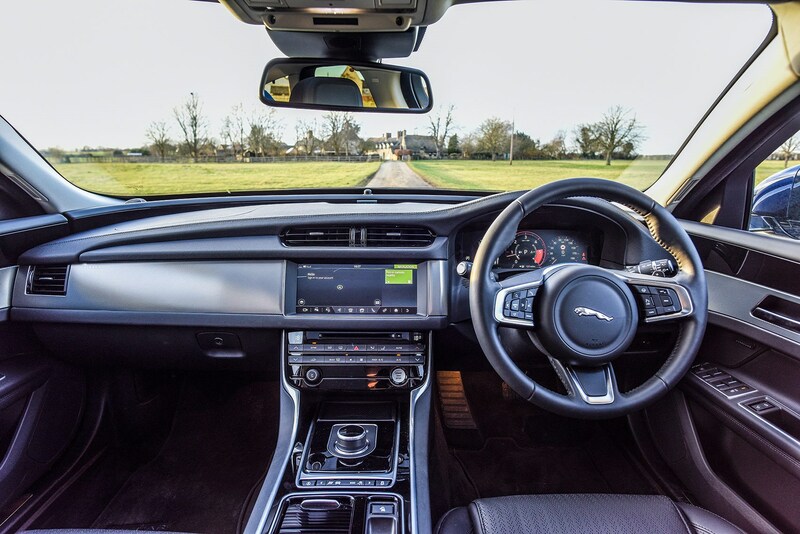 We’ve spent years chiding Jaguar for its off-the-pace electronics, but this brings a digital instrument panel, Pro Navigation System (primed for live traffic updates by buying a SIM card) and access to Spotify tunes and Glympse location sharing by running Jaguar’s InControl app on your smartphone. We also shelled out for high-tech active safety kit including lane-keep assist, and blindspot monitoring with countersteering if you’re on a collision course. Speccing the £980 Convenience pack brought keyless entry and remote boot release. But the jury’s out on this foot-waggling nonsense, and I could live without the pack’s loadspace partition net and activity key. First impressions are of a strained and voluble diesel, a loping primary ride with slightly brittle undertones and precise, measured steering. All very different to the soon-to-depart 503bhp Alfa Giulia, as is an interval of almost a week between fill-ups. Such is the rich and varied tapestry of life on CAR. Time to find out if the XF Sportbrake fits its classic billing.